As we have only been cooking for strangers for four months, there are still so many things we have not tried cooking, such as, game. The game idea presented a lot of experiments on friends who stayed late nights pigeoning and rolling pastries. Its also nice to have the thrill of serving something we have not served before - just to live life a bit dangerously. We love experimenting and the whole point of doing the supper club is to be different from the rest. For this menu, we honestly didn’t care about the cost. We didn’t care that we would just be breaking even. We got the pigeons from Steve Hatt – proved to be much more expensive than other butchers but the quality was outstanding. Our venison fillets came from Yorkshire – all 5 kg of it! It was like one of those moments where upon if we were going to experiment, we might as well experiment well and use the finest ingredients never mind the cost. As I am always front of house and I have served over 300 guests so far, I can instinctively know how everyone feels about our food and I am extremely proud to say that this has got to be the top three greatest menus we have ever done. The venison fillets were perfectly cooked by Simon, tender and pink in the middle, melting like smooth velvet in your mouth. The pigeon pie was a lovely warm, rich, spicy, sweet yet a savory parcel. He hand made all the pastry - the bacon swirl rolls were heavenly with the egg, cooked to perfection dripping slowly as you cut into it. However, our guests loved everything we made, the improved cauliflower and parsnip soup went down extremely well, the bowls looked like they had been cleaned. This time we managed to garnish the soup with parsnip that were peeled into flakes and deep fried. This turned it into a boat where the roasted cauliflower and saint agur cheese could sit on without sinking to the bottom by the time it reached the table. -Roast the above in the oven for about 30 mins or until golden. -Leave enough pieces of cauliflower (just one or two per bowl as garnish) on the side for later. Remove the garlic and rosemary. -2 cloves of crushed garlic. -Blizt with handheld blender or put in food processor – get it nice and smooth. -Cook some more and season with salt and pepper. -Add a little bit of single cream – say 2 or 3 tbs. 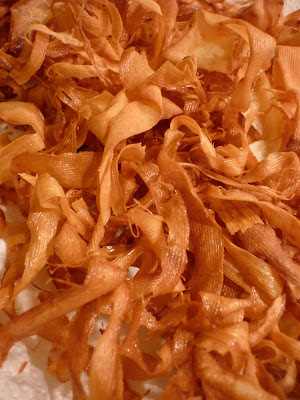 1 x Parsnip - Peel with peeler into thin long pieces – put in deep fryer until crispy and golden. Planning and making great menus and letting our guests eat fantastic fresh food from the finest ingredients is our whole philosophy. We are just about love and food - together. Ok, you have given us some inspiration on what to do with the pigeon breasts now! See you tomorrow, I'll send details now. I'm agog at the idea of a 5kg Venison fillet. Must have been fabulous and the pigeon pie sounds great. Good idea with the cucumber - i can see how that would really add some clear freshness to the gamey meat.